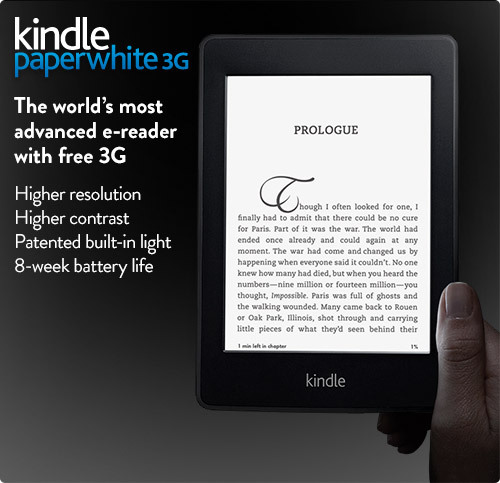 The new Kindles have been announced and you can get your pre-order in! Hopefully they won't sell out before they even ship, but with shipping for some being in November, I am considering which one I want to pre-order. 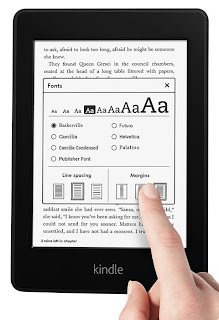 Kindle Paperwhite interests me a lot. It's an e-ink Kindle with a new technology of screen. The touch screen is no longer infrared, making it more responsive, and it has a new frontlit screen. What's frontlit? This is where the light shines onto the 'page' instead of up into your face like a backlit screen. This means it is not as harsh on your eyes, but you can still read in the dark. Higher contrast and more pixels make it even better, with more options for fonts and margins. Other features: 2GB space for 1,100 books. Up to 8 weeks battery, with the light on. Variable light levels. No glare in sunlight.